I have made it to the Conflex Region early ahead of the bulk of the fleet, but the journey was not without its drama! One of the first points of interest on the route was in Pyramoe PM-X b33-6 at planet A 2 A. A Rocky Ice world with a light gravity of 0.10 Gs. 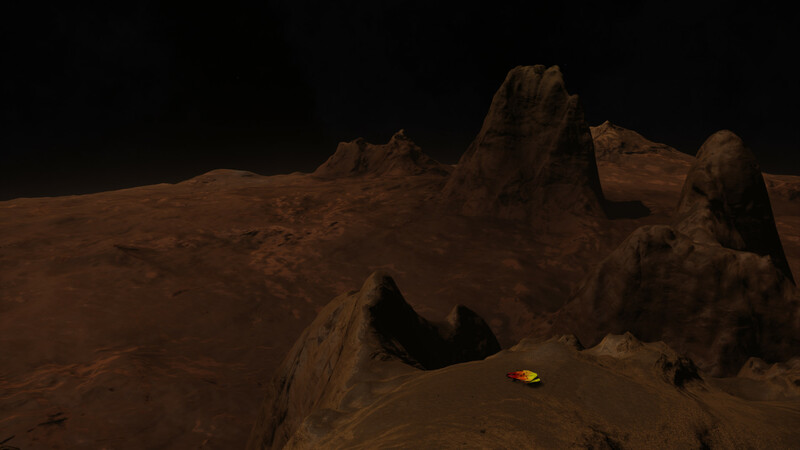 This planet is famous for its majestic high mountain ranges that are scattered across the fairly flat surface, some stretching up 25kms and clearly visible from orbit, these have been named The Arkgamanon Mountain Range. Once out of the glide approach, I felt a sense of awe as I have with many of the sights on this adventure. I boosted down towards a mountain, it seemingly took forever to reach making the size of these geographical marvels even more apparent. There was a difference in the landscape compared to that of Labirinto with its deep chasms, like this place was an inverted version. I had approached on the side that the star was beating down on and everything was a brown-orange, with little to no dust to limit the view. I spotted a suitable landing spot halfway up one of the steep ridges and bought her to a gentle stop, powered down and clambered into my SRV in the back. I then proceeded to drive carefully around the plateau, pausing now and then to take photos of the amazing views that stretched out to the horizon. Crevices, presumably kilometres deep in the distance coloured a turquoise colour, reminding me there was Ice below the surface. I eventually boarded my ship, took off gently and flew to the top of the range. Not sure what came over me at this point. Maybe a flashback to my youth when I used to fly sidewinders at breakneck speed through the asteroid belts in Delkar, the thrill of the giant rocks speeding past the ship. All thoughts of the risks went out the cargo hatch as I aimed to the bottom of the mountain 8 kms below, power diverted to engines I hit boost. I felt adrenaline pump through me, the side of the mountain raced past above my head with the ground slowly but surely coming up to meet me. The altimeter furiously ticked down and my speed meter climbed. I could feel the Gs with the inertial dampeners being pushed to their limits. I soon hit max speed of 476 and was laughing like a crazed person, was this the first sign of the dreaded deep space madness? 500 meters above the deck I eased right off the throttle thinking that the low gravity of the planet would help. I pulled back on the stick, but the last 500 meters kept dropping. “I got this”, I thought, but I barely had the ships angle at 10 degrees up when I thought my neck had snapped. A huge bang came from behind me and then the back of the ship lurched upwards as it hit the ground, lifting me out of my seat briefly and then throwing me forward, jolting my neck as the nose pushed downwards directly at the ground. "Hull integrity compromised, Shields offline". For a moment time slowed and I could make out individual rocks on the surface racing upwards, dust then obscured everything, and I concentrated on my angle and altitude. I pushed hard on my vertical thrusters, gave it a bit of throttle and pulled back on the stick to get some distance from the ground. I looked down at my ship’s hologram on the dash, 20% hull! That had been a very close call, if I had flipped the ship I would have no doubt been killed. Nursing my excruciatingly painful neck, I diverted power to systems and watched my shield slowly ping back up to full strength. I still had nearly 4k ly left to get to waypoint 3 so decided to call upon the services of the Hull Seals. These guys are the ship medics of the fleet, a new organisation that was formed for this expedition to ensure commanders can survive and make it all the way to Beagle point and back. I contacted dispatch on Fleet Comm and described my situation whilst trying to hide my embarrassment. The comms sprang to life immediately, the mechanics sounding off their locations. The dispatch officer CMDR West-Tek then delegated the task to CMDR Thomas and CMDR kingLeBert. After moving away from the planet and with the wing established I turned on my beacon to allow my saviours to drop into my location. They literally arrived within 10 minutes, first CMDR kingLeBert in an Anaconda followed by CMDR Thomas, in what I believe was a Phantom, the whole thing a bit of a blur, presumably due to the shock of the situation, my hands were still shaking at this point. After a friendly flashing of lights and spinning of ships, they deployed Repair limpits that flew over and started repairing my battered hull. As the hull % started to increase I felt myself slump back into my seat and let out a relieved sigh. Once back at 100% they professionally asked if I needed help with anything else like fuel, but I was good, and we said our goodbyes and wished each other luck. I sat there still in space for a few minutes to let myself gather my thoughts and calm down from the ordeal before continuing onward with my journey. Just want to say thanks again to the dedicated Hull Seals, particularly CMDR kingLeBert and CMDR Thomas. The service you are offering the fleet is invaluable and should not go without praise.